While it seems a little self serving, (I am writing this, after all!) I *have* to remind people about my two studios, and many others, that will have some one of a kind, handcrafted work available. 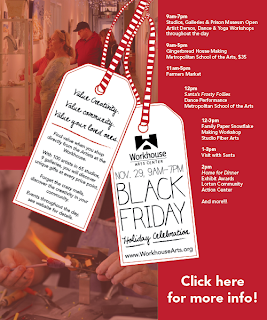 This coming Friday, November 29 at the Workhouse Arts Center, there will be a Black Friday Holiday Celebration. This annual event is a family friendly way to meet with the makers of the pieces and get a special gift for a special someone. In addition, there will be food vendors, a Santa sighting and Christmas musical performances. Demos, plenty of free parking and extended hours (9am-7pm) round out our offering. My work can be found in Building 9, Studio 912. For more information, see the Workhouse website. On the following Friday, December 6, the Torpedo Art Center will be hosting the annual Holiday Open House from 6:30-9pm. There will be artists to make connections with, help with the 'hard to buy for' folks on your list. This is a perfect date/shopping night with food and drink sprinkled around the studios. Leave the kids at home, grab your honey and head to Old Town. Make sure you check out the super gift shop for very cool stocking stuffers for the design minded. My work can be found in studio 320 on the third floor. For more information, visit the Torpedo website. These centers are great resources for the whole holiday season. They can both be rented for a party in a beautiful setting, a wonderful place to explore with out of town family, or just a break from the crazy end of the year rush. In so many European cities, the center of town gets transformed into a winter wonderland of little stalls with twinkle lights and music. In its 9th year, the Downtown Holiday Market brings the joy of outdoor holiday shopping to DC. The list of vendors rotates from day to day, so each and every visit is a new and unique experience. Fine art, handcrafted accessories, food made fresh, antiques and fair trade gifts are all on display every single day for 25 days. Jen-A-Fusion will be in booth #56 from Friday, December 6 through Thursday, December 12th. I've been at this market every year since the beginning and it has become a tradition for me to do my own holiday shopping! So much that I often go back on a day I'm not vending, just so I can walk around and truly enjoy myself. I can't wait to see my market friends and what they are making and carrying this year! While the above is the biggest and the best (in my opinion!) holiday craft show in the DC area, there are a TON of events like this in pretty much every neighborhood. Places of worship, schools and non profit organizations often hold shows where part of the profits go back to the hosting venue. Shopping at these shows keeps your dollars in your neighborhood. For example, I will also be at the Del Ray Artisans Fine Art & Fine Craft Holiday Market for their second weekend of festivities, Friday, Dec 13- Sunday December 15. Come shop inside with an intimate group of craftspeople. Pick up some baked goodies and a poinsettia. Chat with friends, relax. More information here. Here is a very small list of events. There are many, many more to visit! While some people might turn their back on giving a 'used' item for a gift, these stores are places off the beaten path to scout for individuals with specialized tastes. I have a friend whose mother collects salt and pepper shakers. She has scored some very nice and unique sets at antique shops. Higher end thrift stores often have brand new items with tags still on. Consignment shops, which are picker about what goods they bring in, might have a designer section with a vintage Hermes scarf for grandma or the perfect pair of pearl earrings for your niece. Part of the fun of these places is the search! Try to find an independently run store that is attached to a church or non profit, so you know your purchase is helping another person, not just another company. Museum gift shop catalogs have been a holiday staple for years and now with online shopping, you can buy from a gift shop in a city you have never visited. However, if you live in an urban area, hit them up in person. There are many stores I've seen that have very cool gift ideas which are quite specific. Shopping for a history buff? Stop in the shop at the National Archives. Know a design freak? Try the National Building Museum. What about a science geek? Take a peek at the National Aquarium's wares. Fair trade had the sad reptuation of badly made items. Thankfully, there are several organizations that are making great changes to that misconception. Ten Thousand Villages is one of my favorites that I always stop in at the holidays. They carry a large variety of gift items from cookbooks to wooden toys to organic chocolates and bath salts. The prices are reasonable and you can rest easy to know that the person that made this item was paid a fair wage. Busboys and Poets, one of my favorite local restaurant chains, often hold small, fair trade shops. There is always something cool and different to browse while waiting for your DC Tap Water. Red Persimmon Imports, a mainstay vendor at the Eastern Market, has opened a boutique at 3800 Howard Ave, Kensington, MD. I can't wait to visit and see all the wonderful handcrafted goods that the owner, Katrina, helps design in Indian. I love her cotton scarves and wear them year round! Again, many folks might find this completely gauche. However, I think regifting is just another type of recycling. Perhaps you got a scarf last year that just is not you, so it was never worn. Sitting sadly all alone in the back of the closet, it is lonely and unfulfilled. You know your friend Sally would love it. And, it would love Sally. So, off to Sally it goes to live it's destiny. This is also a good way to gift family hand me downs that might be too valuable to give outside the family. Extras from a birthday party. A bottle of wine brought for a party can become a hostess gift. If the other person could use and like it more than you, why not? Most people who are craft-heads and love to made and buy hand crafted know about Etsy, the leader of the online marketplace for handcrafted goods. However, many people might not realize that they are just one of dozens of such websites. Each has it's own look and focus and might take time to get to know. Here is a short list of some of the sites available for artists to list their work. This might not be the most up to date, but does seem to be quite inclusive. Many of these online business will be running Cyper Monday deals, so check to make sure you get your discount! Donating to a cause in the name of a person very passionate about it is a thoughtful way to acknowledge their devotion. Families of child with medical issues might not need another stuffed animal but would appreciate a donation made in their name to a reputable organization that does work in the field. Likewise, a co worker who lost a loved one would be touched by the same gesture. It is personal and effective, without giving a 'thing'. Confused about who to give to? So am I, that is why I'm not endorsing anyone here! There are a few sites that might help you decide. Give Well and Charity Navigator both rate organizations based on many factors and can help you evaluate who to trust. Just in time for Giving Tuesday (December 3 this year), which is a day focused on charity, service and community. Many institutions might have special matching funds for that day, so check before you make a commitment. Also, if you work for a large company, see if they have a matching program as well. Make those dollars count! This fairly broad category is termed 'experience gifts' because they are based on an event, rather than a material possession. Tickets to a concert or play, classes, reservations to see a comedy show, gift certificate to a spa or massage. A chance to go to Medieval Times. Has your husband mentioned several times a new restaurant he would like to go to? Get a gift card. Does your boss think she's Tom Cruise from 'Cocktail', but with all thumbs? Give her a bartending course. Check out Living Social and Groupon for many of these activities, as well as skydiving, cooking, wine tasting and painting parties. Use those Pinterest boards for more than drooling! Get thee to Michael's and get crafting! Make yummy jam and wrap it up in some burlap for a casually elegant gift. Create personal stationary for your friends with all that paper you keep buying (and doing nothing with...) Stamp away bookmarks for your book group. What have you been waiting to make? Make it for all your friends and impress the heck outta everyone. You knew I was going to have to reference Martha here, right?? See what she thinks you should/could make this season. Why not totally ignore holiday shopping this week and participate in an alternative called "Snack Friday"? This time of year is hard on the services that help out the less fortunate, the period right after Thanksgiving especially. Make an effort to buy extra non perishables to donate. No soup kitchens in your area? See if there is a group taking donations. Churches, schools and other civil groups will be in full force right now, especially with the major weather events happening in the world. One lesson I was taught loud and clear as a child was that no matter how little I thought I had, there were others with less. A truly important thought to remember right now. Whatever, however, wherever you spend your dollars this holiday season and throughout the year, balance it out. If you must MUST do black friday at the mall, do Small Business Saturday. Make a commitment for every $10 spent at a big box, spend $5 at a local 'mom and pop', like the Del Ray Variety Store, which is stocked with very clever items for gift giving. I found this article while looking around for this blog post. It is a short check list of critical thinking points to figure out how best to go forward with a major purchase. Even though it focuses on furniture, the same process can be applied to every purchase made. Worth a moment to read. Very good article Jen, lots of great shopping ideas. You are the go to girl. Great article Jen. You are the go to girl for shopping ideas.